Here is an excellent, short article on tooth grinding. We make night guards all the time, and have excellent results with them. If your teeth hurt or your jaw is sore when you wake up, you’re likely grinding your teeth or clenching your jaw at night. Because you can develop long-term problems, it’s important to find out what’s going on. The behavior, known as bruxism, is not uncommon in children but is recognized more often in adults. Research has shown that bruxism originates in the central nervous system. Research also shows that taking antidepressants, especially SSRIs (selective serotonin reuptake inhibitors), can lead to teeth grinding, as can anxiety and stress. Having a competitive personality, alcohol use, smoking and a family history may also play a role for some people. In the short term, grinding and clenching can damage your TMJ, the hinge joints connecting your lower jaw to your skull. Too much pressure resulting from muscle contraction in grinding/clenching can lead to popping, clicking, jaw locking, earaches, headaches and facial pain. If the behavior continues, it can cause facial pain that is chronic (lasting more than six months), tooth fractures, daily headaches, migraines and chronic TMJ problems. Cut back on caffeine (colas, coffee and chocolate), especially before bed. Don’t chew on pens, pencils or other things that aren’t food. Don’t chew gum daily, because it can make existing pain worse. 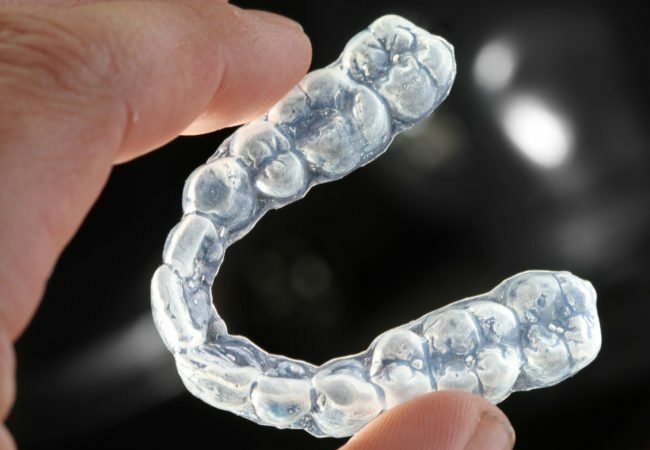 Adjustment of the device by a dentist can help reduce contraction of jaw muscles during bruxism, which may minimize jaw joint stress and protect tooth enamel. Over-the-counter mouthguards provide coverage only over the teeth, she notes. Daytime teeth grinding and jaw clenching are often unconscious behaviors, but you can train yourself not to do them, Dr. Kahn says. The key is to maintain a proper mouth position. Whenever you think of it, keep your lips together with your teeth slightly apart, and rest your tongue against the back of your front teeth. Doing this eliminates jaw joint stress and stops you from grinding your teeth during the day.